March was a momentous month for the people of Garsen, home to The Sentinel Project’s Una Haikika violence-prevention initiative in the Tana Delta area of Kenya, with many high-profile political events taking place here. Interestingly, during SP’s surveys in this area in February, we found out that many people distrust politicians. Many stated that if ever they had information to report related to the mistrust that breeds violence between tribes, they would not make their report to politicians, either elected or unelected. Tana River Governor Hussein Dado broke the cycle that has existed for years, in which politicians make an appearance in the region only when looking for votes. Although the headquarters of Tana River is in the Hola district, in March Governor Dado visited Garsen, which is being transformed through immigration into a cosmopolitan metropolis. Garsen’s growing prominence also explains why SP’s Una Hakika project began its work there. The city’s relatively good infrastructure and communication networks will meet program needs, since Una Hakika largely depends on technology in its approach to violence prevention. 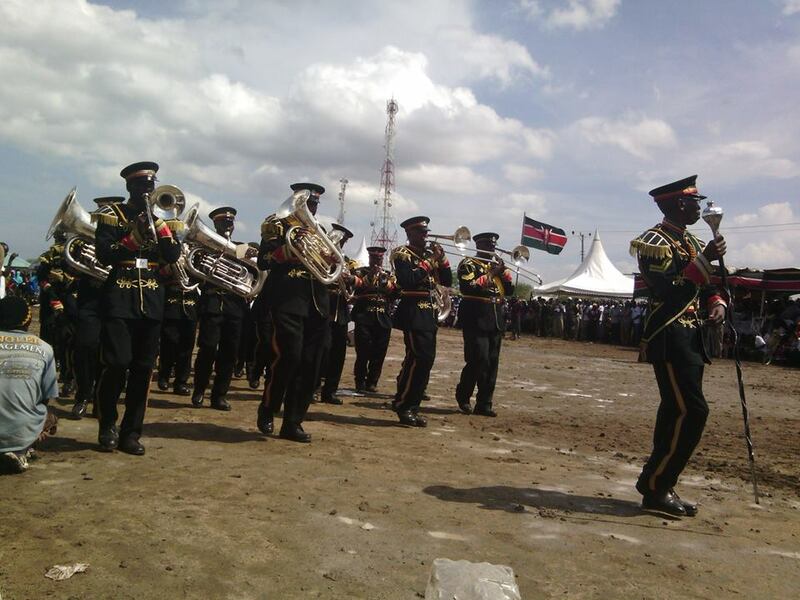 Garsen is also relatively neutral ground, having the Orma, Pokomo, Wardei, Somalis, Kamba, Munyoyaya, Malakote, Bajuni and Watta peoples existing side by side. 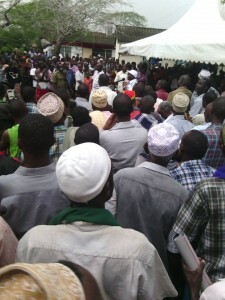 Governor Dado’s political appearance attracted residents from all corners of Garsen, most of them already his supporters. The Governor was so enthusiastic to meet his loyal supporters one year after elections that he missed his lines and addressed the people in his native language. The crowd was full of expectations, with everyone anxious to know what their leader had in store for them. 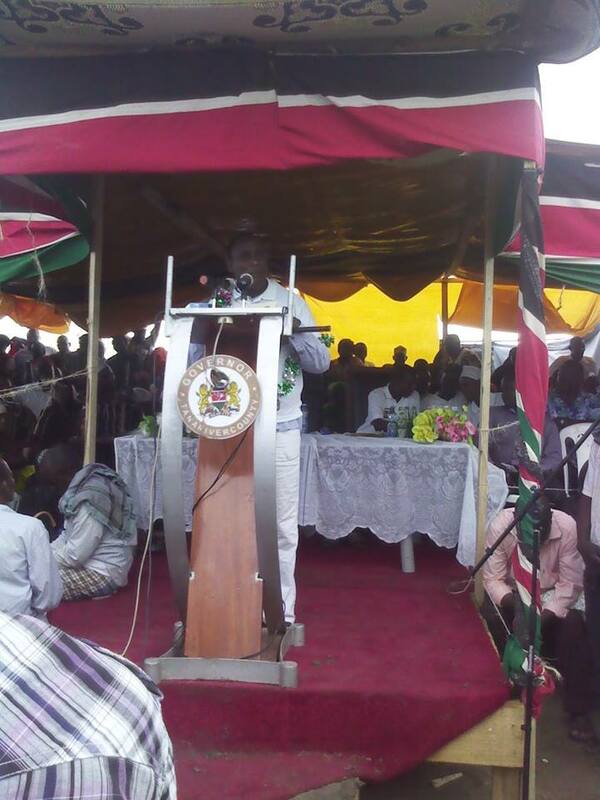 The visit was meant to create a platform for the Wiper Democratic Leader Hon. Kalonzo Musyoka to pay tribute to the people of Tana River county for electing a flag bearer from his party, a task that he did well. In his company was the Women Representative Hon. Halima Ware, who also went through on a Wiper ticket. Her key points focused on women’s empowerment, but the crowd loudly pressed her to put more actions to her words. Mombasa County Senator Omar Hassan expressed his disappointment in the fact that despite the majority in the county being Muslims whose children have the ability to cram the Quran, the county still trails in National exams. Largely inarticulate, the politicians left most people with more questions than answers. None was keen to address the conflicts that have deterred development in most parts of the region. Another major event in March was the grand opening of the Garsen Cultural Centre, under the auspices of Ministry of State for National Heritage and Culture. Its mission is to promote and preserve diverse cultural and natural heritage. 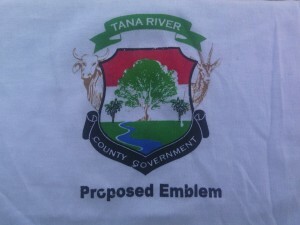 As the icing on the cake, the Governor officially launched the Tana River county flag and emblem. This follows the passage of a bill by the National Assembly that bars Cabinet secretaries and Governors from flying the national flag on their vehicles.The National Flag, Emblems and Names (Amendment) Bill, 2013, allows only the President, Deputy President, the two Parliament Speakers and the Chief Justice to fly the Kenyan flag. Governors are allowed to fly flags of their respective counties, as provided in the County Governments Act. The last big event in Garsen was the celebration marking one year of successful devolution in the county. All political, administrative, religious and local leaders were present. This was a day when most people laid aside their religious, ethnic and gender differences and came together for one common purpose, listening to what Hussein Dado’s leadership has so far achieved. Despite silence on the issue in previous political gatherings, all leaders expressed their sentiments regarding conflict and peaceful co-existence, in one voice condemning conflicts and stating the view that no development can take place in the absence of peace. The Governor applauded efforts by the District County Commissioner, who has been on the frontline of peace building efforts and is responsible for all matters of security. He mentioned the need for creating a consultation forum for peace. Members of the peace forum to which Una Haikika belongs are likely to gain a place in this wider forum. Governor Dado introduced all the Ousted county executive committee members as the incumbents who stood against a court ruling that declared Dado’s cabinet unconstitutional for lack of ethnic and gender balance. This was followed by claims that huge tracts of land have been grabbed all over Tana Delta, and Dado issued a stern warning to any chief who engages illegally in land selling and allocation. His speech ended by condemning the central government for gazetting 27,000 acres of land as forest reserve out of the total 38,000 acres, as human beings are equally important. He also clarified that the central government had not notified him of the visit of Kenya Cabinet secretary for Agriculture, Livestock and Fisheries Hon. Felix Koskei to Kipao and Tarassa, which took place without his knowledge. Garsen Member of Parliament Ibrahim Sane added his voice on the subject of Felix Kosgei’s visit, referring to him as an inciter who should never be allowed to set foot in the Tana Delta again. He said the Hon. Kosgei is using Galana ranch to divide people on ethnic grounds by having ethnic-based meetings. Galana is a food security project situated in the Tana River that will see over one million acres brought under irrigation in the next five years. One member of the county assembly representing women requested the governor to devise means of conflict resolution and to set his eyes on Kipini East, where residents are being chased away by business tycoons. She believed that Tana Delta is still not ready for development due to divisive politics. She also cited illiteracy as a “a very bad disease,” noting that in 1982, Tana Delta was number one in the country in terms of educational performance, but the glory has faded over the years.